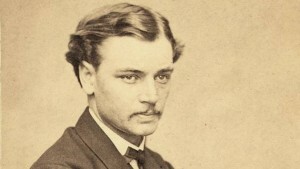 April 15, 1865, at 7:22 a.m.
After John Wilkes Booth shot President Abraham Lincoln, soldiers carried Lincoln from Ford’s Theatre and across Tenth Street, so that he could pass his last moments peacefully, surrounded by those who knew him best. He died in the Petersen family’s boarding house at 7:22 a.m. on April 15, 1865. The wounded president would not survive. At the time, many people felt a theatre was not a proper place for a president to die. The White House was only six blocks away—but a bumpy carriage ride on Washington’s unpaved streets might kill Lincoln immediately. Soldiers carried Lincoln down the stairs of the theatre and out onto Tenth Street. Standing on the Petersen boarding house stoop across the street, Henry Safford had heard the commotion. He knew that Willie Clark, a fellow boarder, was out for the night—and his room was vacant. He yelled to the soldiers, "Bring him in here!" In the front parlor, First Lady Mary Lincoln awaited word of her husband, occasionally venturing in to visit him. 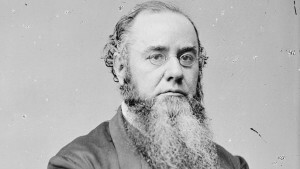 In the back parlor, Secretary of War Edwin Stanton interrogated witnesses and directed the investigation. Outside, thousands of people crowded onto Tenth Street and kept vigil through the night. President Abraham Lincoln died at 7:22 a.m. on April 15, 1865. Mary Lincoln was not in the room with him. Soldiers quickly removed his body to the White House for an autopsy and to prepare for a funeral. At 11:00 a.m., Vice President Andrew Johnson took the oath of office as the 17th president. Follow the events of Lincoln’s last night through the eyes of the people who lived through it. 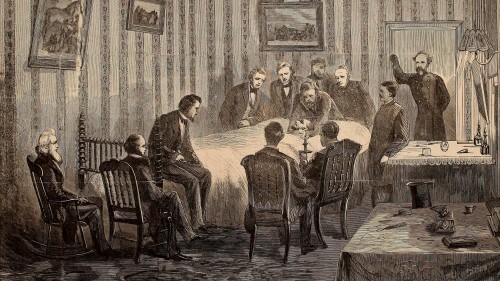 During the night that President Lincoln lay dying in the Petersen House, more than 40 people came in and out. 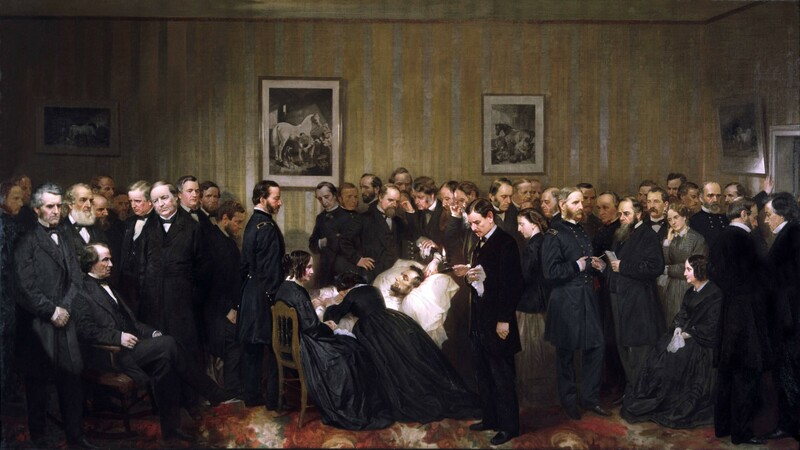 In 1868, artist Alonzo Chappel depicted all those who had come in and out as present in the room as Lincoln died—a physical impossibility. Meet some of the people who attended to the dying president that night. 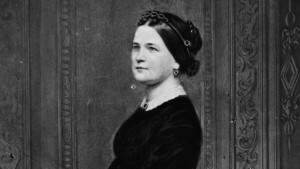 A close friend of First Lady Mary Lincoln, Elizabeth Dixon stayed by the First Lady’s side during the night. Mrs. Dixon’s sister, Mary Kinney, and niece, Constance Kinney, were also with her. Mrs. Lincoln was so visibly distraught that Secretary of War Stanton ordered the First Lady out of the president’s room. She spent the night in the front parlor and was not present when her husband died — his identity as president overriding that of husband and father. The president’s son visited the house during the night but was not present for his father’s death. He spent much of the night with his mother in the front parlor. The Secretary of the Navy spent most of the night inside the Petersen House. His diary presents one of the fullest pictures of the night Lincoln died. 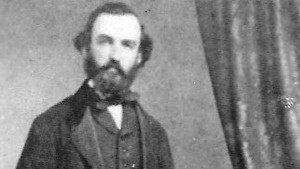 Dr. Todd, a resident of Lexington, Kentucky, was visiting his cousin, First Lady Mary Lincoln, in Washington on April 14, 1865. He was supposed to meet with the president the next day. Instead, he tended to his cousin’s dying husband. 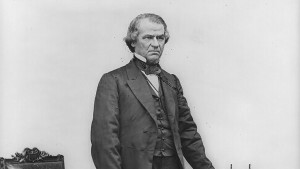 Vice President Andrew Johnson visited Lincoln briefly in the Petersen House during the night, but was not present at Lincoln’s death. He returned to his hotel room to prepare to assume the presidency. The Secretary of War conducted interrogations in the rear parlor of the Petersen House. 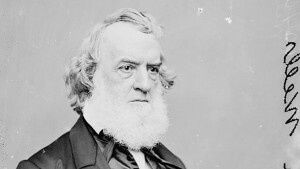 He directed the investigation into the President’s assassination and ordered additional security in case the assassination was part of a Confederate attack on Washington. 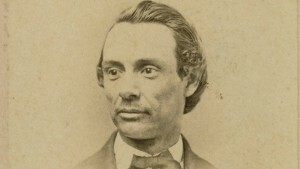 The pastor at New York Avenue Presbyterian Church, which Lincoln attended, gave a sermon at Lincoln’s D.C. funeral a few days later. 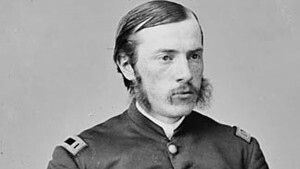 Major Rathbone spent most of the night in the hallway of the Petersen House, bleeding from the knife wounds he received from John Wilkes Booth. Dr. Charles Leale was in the audience at Ford’s Theatre and attended to Lincoln in the Presidential Box along with Dr. Charles Sabin Taft. 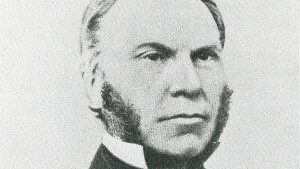 They then took leading roles in his care at the Petersen House, along with several other surgeons. 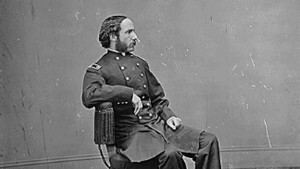 Dr. Charles Sabin Taft was in the audience at Ford’s Theatre and attended to Lincoln in the Presidential Box along with Dr. Charles Leale. They then took leading roles in his care at the Petersen House, along with several other surgeons. My dress is saturated with blood; my hands and face were covered. You may imagine what a scene, and so, all through that dreadful night when we stood by that dying bed. Poor Mrs. Lincoln was and is almost crazy. 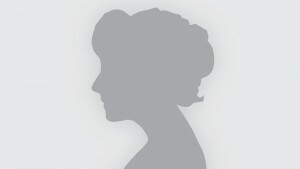 Photo of Clara Harris courtesy of Abraham Lincoln Library and Museum. A formerly enslaved African American who was a close friend of First Lady Mary Lincoln and a dressmaker. U.S. Army veteran and amputee who lived down Tenth Street from the Petersen House. Dr. Charles Leale began attending to the wounded President Lincoln in Ford’s Theatre. What happened to the House Where Lincoln Died? Explore how its residents fared and how this small house later became a museum with 3,000 artifacts. How did people around the country and world respond to Lincoln’s assassination? See primary sources detailing what they said.